What is "apparent wind" ? Apparent wind is the wind you can feel when on a boat. This wind is different from the real wind, as we're going to see. These two winds may differ quite a lot. The higher the boat speed, the higher they'll differ. A simple example is cylcing. If you ride a bicycle with no real wind, you feel an apparent wind which is exactly opposed to your speed direction. If you ride a bicyle at 20 km/h facing a 10 km/h wind, you feel an apparent wind which is 20+10=30 km/h. And with a 10 km/h real wind from rear, the apparent wind is 20-10=10 km/h. The main consequence of apparent wind while sailing is that in many cases, whatever its course, a boat is "facing" wind. This is particularly true for fast sailing devices such as windsufing gear which are planning faster than wind. In this particular case, we can demonstrate that whatever your course is (even deep downwind), you are always facing apparentwind (I mean wind comes front of you, not from rear). For slower sailing boats, apparent wind will vary more depending on the course. 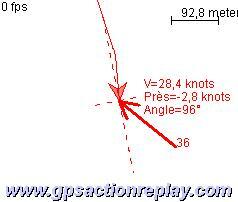 With upwind or square courses, apparent wind comes from front. But for downwind courses, the apparent wind may come from rear. This is particularly true for absolute downwind course (going in the wind direction), of course. 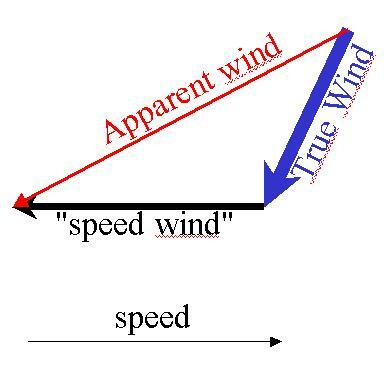 Besides this direction effect, the other effect is that the speed of apparent wind may vary quite a bit from real wind speed. Knowing apparent wind may help to best set your sail. Depending on its direction and its speed, you'll set your sail direction and sail power in a specific manner. It's well known for formula racers in windsufing, since they flatten their sail upwind (because of an apparent wind very much facing and high) and they set a loose uphaul tension downwind to have more power (because apparent wind is less from front, and its speed decreases).